The Parramatta campus of University of Western Sydney is a significant and historic place. Continuously used since 1813 as a public institution – first as a school for the new colony’s female orphans, then as a psychiatric hospital and since 1998 as a university. The sequential development has resulted in a fine grained built form with a series of non axial vistas and interstitial places bounded by a cohesive group of buildings. However as is common in many institutional places a pragmatic need for expansion often disfigured many of the fine architectural attributes of the existing buildings and landscape settings. Since 1998 the University has transformed the campus into a vibrant place for education and engendered a new layer of architectural meaning. Early projects involved the renewal of the 19th century ward buildings and the nationally significant Female Orphan School. As the campus population grew the demand for a truly student focused public domain at the centre of the campus became critical. With population growth from 4000 to well over 9000 in the space of 2 years, there was a clear demand for improved hospitality services on the campus. Until this project was completed there were limited opportunities and those that existed were on the periphery and quite internal. The Boilerhouse adaptation and the attached outdoor pavilion is a direct response to this situation – providing a place that is lively and transient in the manner of a market square. At a detailed level the project introduced a new physical presence. It is not historicist nor is it overtly contemporary yet it makes a new statement of university life. The ground planes of the three key buildings of the Precinct reach out to the cranked pedestrian concourse removing the artificial barrier of building edge and public domain – decks and terraces provide places to stop and unwind between lectures. These transformations make for a broader conception of the student hub than a contained and defined student union building. The project team, including artists and graphic designers worked collaboratively and has generated a remarkable set of devices that together make up a rich and multilayered public domain. In stitching together disparate buildings the landscape and the built environment come together. 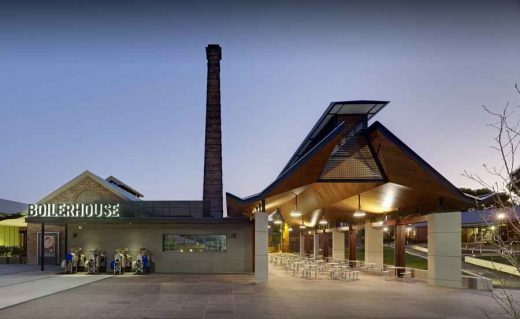 The Boilerhouse Precinct offers the Parramatta Campus a truly student focused public domain.